We’d love your help. Let us know what’s wrong with this preview of Sacrifices by Kristy Brown. After almost beating the villainous Witch Queen, Kiera’s triumph is tainted with sadness for the loss of Joe and Daz. When the handsome Prince Zakk asks Kiera to re-enter his world in order to save her friend, she does not hesitate. On their perilous journey Kiera realizes that she is there to save many lives. As she comes face to face with her evil nemesis once again, Kiera After almost beating the villainous Witch Queen, Kiera’s triumph is tainted with sadness for the loss of Joe and Daz. On their perilous journey Kiera realizes that she is there to save many lives. As she comes face to face with her evil nemesis once again, Kiera comes closer to finding out the truth to why she has been chosen. To ask other readers questions about Sacrifices, please sign up. Win Great Stocking Stuffers from Kristy Brown for tweens! Books one & two of her Kiera's Quest Series! On your mark, Get set, aaaaand WE’RE OFF! At a blistering pace of adventure, action and danger, Kiera and Prince Zakk are crossing realms to save Kiera’s friend from the villainous clutches of the Witch Queen. 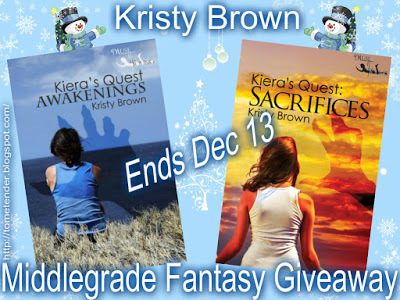 Kiera’s Quest: Sacrifices by the wildly creative Kristy Brown continues Kiera’s quest to discover why Win Great Stocking Stuffers from Kristy Brown for tweens! Books one & two of her Kiera's Quest Series! Kristy Brown has, once again created a fascinating,Tween/Ya read that is filled with colorful scenes, a cast of original characters and a plot that spirals around just enough to keep answers just around the corner! Written with bite size chapters that create even more intrigue and make for a great starting and stopping point, Kiera’s Quest: Sacrifices is the perfect answer to a wonderful summer read. When Kiera almost defeated the evil Witch Queen, her joy was dampened by the loss of her friends Joe and Daz. When the handsome prince Zakk asks Kiera to return to his world to rescue her friends, Kiera doesn't hesitate, and follows him into the unknown. I was given a copy of this book to read after I read the first book in the trilogy. I really enjoyed the first book as it was a quick and easy read that made a nice change to reading long books. This book was also a novella, at around eighty pages long. The story picked up where the last book left off, with Kiera re-entering Zakk's world. I loved that the story was action packed, the Author has certainly managed to pack a lot into the small amount of pages. Of course, as it's a short book, the story is fast paced which keeps it interesting, but for some reason I just didn't enjoy it as much as the first book. Maybe as the first book was an introduction to the world of Zakk, it was more exciting and fresh for me. That's not to say that this book isn't exciting though. It's full of shocks and surprises, and the cliff hanger ending has left me wondering how Kiera will deal with her ever growing problems. There's a lot of revelations about Kiera in this book, and she seems to take them well and adapts to her new discoveries with no complaints. She's a strong character, but she's also confused about her feelings for Zakk, and worried for her friends. I feel that this conflict within her makes Kiera a more realistic character. It's all well and good throwing a young girl into danger in a different world and have her suddenly become incredibly brave; but she's still young and it's natural for her to be scared and confused, so I felt that the Author did a great job of creating a realistic teenage character. Firstly I’d like to thank Kristy Brown for sending me this eBook to read and review. I previously read, and really enjoyed, the first book in the Kiera’s Quest series Kiera’s Quest: Awakenings so I was looking forward to this one which is the second in the series. Again this jumped straight into the action following Kiera and Zakk as they tried to save her friend, the addition of Jude and Alex made things very interesting with Kiera becoming a little bit jealous and territorial over Zakk. The won Firstly I’d like to thank Kristy Brown for sending me this eBook to read and review. I previously read, and really enjoyed, the first book in the Kiera’s Quest series Kiera’s Quest: Awakenings so I was looking forward to this one which is the second in the series. Again this jumped straight into the action following Kiera and Zakk as they tried to save her friend, the addition of Jude and Alex made things very interesting with Kiera becoming a little bit jealous and territorial over Zakk. The wonderful descriptions of everything conjured up vivid images in my mind and made me feel like I was there with the characters. Back on earth another of Kiera’s friends, Maddy, was still feeling the loss of her friendship and potential relationship with Daz. She also seemed to be under fire from the police and teachers due to Kiera’s mysterious disappearance, she got a big shock when Kiera’s uncle revealed a very important secret to her. The Witch Queen was as evil as ever but weakened because of what had happened in the previous book with Kiera. The way she rejuvenated her energy was not very pleasant but it made sense of some of the other things that had happened. Captain Terrence and the team of rebellions were an interesting twist to the story, I really enjoyed this part because it made me think back to the previous book and look at things differently. As with the first book I was on the edge of my seat wondering what was going to happen next, I just could not predict the outcome and a couple of very unexpected revelations literally made me gasp out loud! This book starts off right where the first book ended. We must say Sacrifices is just as good or maybe a bit better than the first book Awakenings. This story is incredible and has an ending you do not see coming.Sacrifices is filled with action, a little romance, and wonderful adventures that combine the world of Vortex, which we wish really existed, and Earth. Kristy does a remarkable job ending each chapter with a cliffhanger that makes it difficult to put the book down. She also has a brill This book starts off right where the first book ended. We must say Sacrifices is just as good or maybe a bit better than the first book Awakenings. This story is incredible and has an ending you do not see coming.Sacrifices is filled with action, a little romance, and wonderful adventures that combine the world of Vortex, which we wish really existed, and Earth. Kristy does a remarkable job ending each chapter with a cliffhanger that makes it difficult to put the book down. She also has a brilliant talent in creating characters you will fall in love with. Kiera and Prince Zakk are still amazing together . Although Prince Zakk did upset us for a minute with his wandering eye. And Kiera can be a little possessive of him at times. The Witch is still as evil and hilarious as ever. We also fell deeper in love with Maddy, who can hold her own on Earth.We love how she accepted the truth. The addition of new characters brings even more to this series. We usually do not like when there is more than one POV because it good get confusing, but Krity handles this just right that you never have to wonder who is speaking. This is a fantastic story for people of all ages. We can even see it becoming a movie or a weekly series, which everyone will enjoy. Besides, who can’t love a book the has tunnels fulll of poo to entertain us. Trust us this book might be short but it’s filled with so many twist and turns you will be entertained for hours. We can’t wait for the next installment of Kiera’s Quest. Kiera’s Quest: Sacrifices is the wonderfully inventive sequel to the hugely enjoyable Awakenings, released last year. Filled with action and adventure, Kiera’s quest to save her best friend is fraught with even more danger, more double crossing, and sewer tunnels filled with poo! The cast of characters remains as colourful as ever, with the introduction of new faces adding to the charm of Awakenings. Alongside Kiera again is Zakk, Prince of Zantar, and newbie, Mouse, a cheeky little Nerakian who Kiera’s Quest: Sacrifices is the wonderfully inventive sequel to the hugely enjoyable Awakenings, released last year. Alongside Kiera again is Zakk, Prince of Zantar, and newbie, Mouse, a cheeky little Nerakian who has designs on snatching the boy prince for herself, much to Kiera’s disgust. Meanwhile, back on earth, Maddy finds there is more to Terrence the dog than meets the eye and Uncle Tom proves to be more than just a simple shopkeeper, hinting at a larger role to play in future instalments. The evil Witch Queen is as deliciously nasty as ever and, along with her equally sinister sidekick Googe, share some of the best moments in the book. The story builds to an explosive climax as the Witch Queen attempts to blow open the vortex resulting in one of the best twist endings I’ve ever read. ‘Sacrifices’ is a terrific addition to the story. It moves along at a fast pace with each chapter ending on a cliffhanger that compels the reader to reach for the next. It also does what a sequel should do – pushes the story along seamlessly, while offering the promise of so much more to come. Author Kristy Brown should be proud of her achievements. For a reasonably short read, Sacrifices has a lot going on. Lots of new friends and some new foes; a few friendly faces re-appear, and some new twists and turns make for a non stop reading adventure. However, lots of scene changes and different points of view did make it a slightly disjointed read, I mean 28 chapters in less than 80 pages? Overall I think it worked out okay, but it did take me a few of those chapters to get back into the fast paced world that author Kristy Brown has created. Well For a reasonably short read, Sacrifices has a lot going on. Well written, with plenty of great characters and story arc's - Kiera's Quest: Sacrifices is a great continuation of an intriguing and action packed story, with a cliffhanger to leave you gasping! This AMAZING author asked me to review this and all I can say is, WOW! What a fun series! And Geez SOOOOO many twists and turns! By the time I was done reading I was like, "what just happened???" In this book the plot thickens as we follow Zakk and Kiera back in the clutches of the evil Queen and what friends you think are friends are not and the relationship between Kiera and Zakk is not what it should be and MAN this is nuts! SO if you are look of a fantasy QUICK read? this is it! check these b This AMAZING author asked me to review this and all I can say is, WOW! What a fun series! And Geez SOOOOO many twists and turns! By the time I was done reading I was like, "what just happened???" This is the second book in a YA series for children aged 9 to 16. I really enjoyed it! Kiera Matthews is a wonderful character. She is a typical young teen with hopes and dreams. I liked her very much. She is kind, caring and sensible. However, after meeting Zakk, a prince from Zantar, a parallel world, and battling the Witch Queen there, Kiera is now struggling to come to terms with the loss of her friends, Joe and Daz. T I received a complimentary copy of this book in return for an honest review. This is a fantastic continuation of the series. I loved visiting these characters again. I was hooked from the first page of the story. It is told through several character's points of view, which made it interesting. I did miss the old version of the evil Witch Queen, though; she didn't seem so intimidating in this story. Maybe it is because she had been severely hurt and damaged by Kiera in their battle. She did terrible things, don't get me wrong, but her personality seemed more subdued. However, that being said, there are plenty of twists and turns in the story which took me by surprise. The scenes are all well described and I felt like I was there, watching it unfold. I was saddened when Joe was kidnapped in the first book, and angry at the Witch Queen for torturing and brainwashing him in this one. But I was totally shocked at one major revelation that I certainly didn't see coming regarding Kiera, and it completely floored me! I found myself on a roller coaster of emotion and even shed a few tears throughout this book; there is deceit and betrayal mixed in with loyalty and love in this tale. Unfortunately, I reached the end of the book all too soon, and I could have screamed in frustration; I groaned instead! I felt like I had only just started to read the story when it finished. I know this book is aimed for younger readers and I am an adult, but I thoroughly enjoyed journeying between Earth and Zantar. I am now looking forward to continuing the series by reading Perceptions as soon as possible! Recommends it for: People who read the first, middle-graders in search of a quick read. Kiera's Quest: Sacrifices picks up right where the first book leaves off; with Kiera and the charming Prince Zakk on a mission to rescue a friend. Overall, I'd just like to generally state that the grammar/punctuation/spelling in this book was much better than in the first. I was literally SO HAPPY. Finally...real editing. That being said, it does still have it's issues. And let's not kid ourselves, the most blatantly obvious is the MC herself, Kiera. I would have hoped that at this point (what with being a hero and all now) she would be a least a tad more mature. ONE FREAKING TAD. One minuscule, zillionth of a braincell more mature. That's all I'm asking for. Instead, we're left with a whiny cries-at-the-drop-of-a-hat teen girl with some serious upstuck-ness. I tried to contain my violent tendencies, though, and managed to avoid doing any obvious harm to my computer. I liked the storyline in this book, like I did in the first, though again I thought the writing was very amateur, with a lot a basic, un-built sentences and weak descriptions. I did like that little twist near the end, however, (view spoiler)[ Zakk and Kiera and brother and sister! (hide spoiler)] it was really unexpected, but I do think the plot of the next books will work better with it that way. I'm afraid the author may be dragging this whole "Witch Queen" thing out a bit too much though, I mean, how many books are there in this series? three? four? Eventually, we're going to need a new antagonist. Like Darth Vader. That's be awesome. Also, all the teens in this book sound like 12-year-olds for some reason, and I kept picturing them younger than they were supposed to be. I like Daz. He's a pretty cool guy, imo. I expect the second book of any series/trilogy/whatever to be better than the first, and unfortunately for me, this one isn't, and though it's still a fun quick read for middle-graders, I don't think many teens would enjoy it. RATING: 4 KIERA & THE CREW STARS!! Sacrifices is book two in Kiera's Quest . These books are aimed at tweens and up. I really loved book 1, Awakenings and could quite easily see it as a basis for a Disney movie. Kristy has such fun with her characters and the Witch is always a hoot. These are deliberately short reads. Short quests that Kiera and crew go on. This book has several different POV's and we are going back and forth between two worlds. I love me a vortex, there is just something fun about the word vortex. We get introduced to some new characters and some fun twists. I was beginning to question young Zakk, he seemed to have wandering eyes in this book. Maddy gets some great air time in this book. I enjoy her character and she isn't a dummy. She can handle the truth! Terrence the dog is a fun and surprising character. I really enjoyed Terrence's scenes. I love Kristy's imagination, she has it in buckets. For short reads she does fill the pages with lots of fun and mayhem. Albatron, D'rogs, see-through bombs, dragon, vortex's , Witch, Googe the Witches side kick, Terrence the wonder dog, Joe, Mouse, Alex, Kiera, zakk, Uncle Tom and more have come out to entertain us. Even poo tunnels.....yes stinky , icky, poo tunnels. I could honestly quite easily see both of her books as much longer stories each or joined as one book. Put both of these books together and it would be a fun Disney kids movie. Kristy has a really cool way of writing a world kids and adults would love to be a part of. I am looking forward to more of Kiera's Quests. I love me a vortex, there is just something fun ab RATING: 4 KIERA & THE CREW STARS!! Sacrifices is the second book in the fantasy series Kiera’s Quest targeted at the YA/tween audience. You can read my review of the first book, Awakenings, here. Sacrifices opens with Kiera’s friend Joe in the clutches of the Witch Queen. She is very weak after almost being defeated by Kiera although she has her way of replenishing her energy. We’re introduced to new character Jude (aka Mouse). Jude is their guide through the sewer tunnels that will eventually lead them to the Dark Palace. In our wor Sacrifices is the second book in the fantasy series Kiera’s Quest targeted at the YA/tween audience. In our world, the police become involved because Kiera, Joe and Daz are missing. Visiting the school, they try to find out what has happened. Maddy becomes confused by a peer when she glimpses a different side. In Sacrifices, we still have plenty of action to engage us but the reader also finds out more about Zakk’s world, Zantar. We find out who is a ‘friend’ in our world and a surprise twist about who a traitor is. There’s another surprise with Terrence the terrier … and Uncle Joe is not all that he seems to be. There are new characters who tie-up with the ones we already know from Awakenings… and a reveal that will make you gasp in surprise! The climax is nail-biting. I thought it was a very creative ending leaving the reader on a cliff-hanger! As Zantar is suffering from the Witch Queen’s experiment, everyone is blasted through the vortex back into our world. Everyone including the Witch Queen who has made a change that will certainly reverberate through our world. What is left of Zantar? What dire consequences will there be in our world with the Witch Queen on the land? I’m really looking forward to finding out what happens! Firstly I would like to thank Kristy Brown, author of Sacrifices, for giving me this wonderful opportunity of reading and reviewing this wonderful book. Wow, it's really cute, sweet and great and I enjoyed reading it as much as book 1 as it felt like a fresh splash after reading tons of adult books. Well this book doesn't lack in action or dark scenes so don't worry, it's really an awesome read for all age I got this book from the author, free of cost, in exchange of an honest review from my side. Wow, it's really cute, sweet and great and I enjoyed reading it as much as book 1 as it felt like a fresh splash after reading tons of adult books. Well this book doesn't lack in action or dark scenes so don't worry, it's really an awesome read for all age group. I really enjoyed experiencing the different paths that Kiera and Zakk's life takes in this sequel and enjoyed it totally. The evil witch did really seemed to have become more dangerous and even more evil, if that's even possible and I liked the way the author made this story even more challenging than book 1. The writing style and skill of the author is really remarkable and it helped me to get connected with the characters and the plot as well. There is sweet romance, test of friendship, loyalty, shocking revelations of dreadful secrets, dangerous twists and turns and a quick pinch of sweet and salty humor. I'm really excited for book 3 in this series and I'm sure that it would be equally great like book 1 & 2 and I know it's not fair but fingers crossed that the generous author would give me an opportunity of reviewing book 3 as well. Sacrifices is another short, intense read from Brown. The story picks up right where Awakenings left off and we join Kiera and Zakk as they go back to his world to save her friend. We get introduced to new characters in Sacrifices that will make or break this quest to save Joe. Will they be able to save him before it is too late? Or was this quest doomed before it even began? Brown is a wonderful story teller and seeing the worlds she has created for this series is truly fantastic. Not only do we Sacrifices is another short, intense read from Brown. The story picks up right where Awakenings left off and we join Kiera and Zakk as they go back to his world to save her friend. We get introduced to new characters in Sacrifices that will make or break this quest to save Joe. Will they be able to save him before it is too late? Or was this quest doomed before it even began? Brown is a wonderful story teller and seeing the worlds she has created for this series is truly fantastic. Not only do we have Earth and Zanter but other worlds as well are all connected through vortexes, making for a very interesting read. But that ending is what made the book. WHOA! Didn't see it it coming. Here's a preview of the review. The full review will be published at The Guide To Good Books on Oct. 3rd, 2013 at 6:00 PST/ 9:00 EST/ 2:00 BST. As the second installment of the book series Kiera's Quest, Sacrifices dealt with the continuation of Kiera's journey after the horrible events that ended the first book. Back on Earth, Kiera is listed as a missing person along with her friends Daz and Joe; Maddy was left alone to carry the burden of her friends' "disappearances." What made the situatio Here's a preview of the review. The full review will be published at The Guide To Good Books on Oct. 3rd, 2013 at 6:00 PST/ 9:00 EST/ 2:00 BST. Back on Earth, Kiera is listed as a missing person along with her friends Daz and Joe; Maddy was left alone to carry the burden of her friends' "disappearances." What made the situation worse is the fact that she knows where Kiera is and why she left and she knows what happened to her boyfriend Daz and Joe. She's forced to keep it secret. Kiera, on the other hand, struggles with Prince Zakk to defeat the Witch Queen and indirectly looking for Joe and Daz. In this installment of Kiera's Quest, we finally get to see Zakk in action and not as a plastic Ken doll. He was brave and very noble (duh, he's a prince). He always made sure that everyone was safe and didn't leave anyone behind. For his introduction as a walking and moving character, he hit it hard and I really liked him. After their tangle with the Witch Queen, Kiera and Prince Zakk make it out alive but lose friends. When Prince Zakk asks Kiera to help him save Joe and Daz, she jumps at the chance. She can't imagine life without them. They know it won't be easy because the Witch Queen is sure to be watching for them, but with some help, they just might be able to rescue Joe and Daz and save themselves. They never expect life changing secrets to be revealed. Amazing! This book takes you on a journey you won't s After their tangle with the Witch Queen, Kiera and Prince Zakk make it out alive but lose friends. When Prince Zakk asks Kiera to help him save Joe and Daz, she jumps at the chance. She can't imagine life without them. They know it won't be easy because the Witch Queen is sure to be watching for them, but with some help, they just might be able to rescue Joe and Daz and save themselves. They never expect life changing secrets to be revealed. Amazing! This book takes you on a journey you won't soon forget. The characters are well developed and easily relate-able. The story is so well written you'll be lost in the pages in a good way. I recommend this book for all tweens/YA. It will keep them interested in reading for sure! Gift this one and book one, to the tween in your life! I found no issues with this one. As we get into book 2, the writing just keeps getting better. I most definitely read this one in one sitting. There wasn’t a boring moment, and the author did a great job keeping you guessing as to what was coming next. I even had a hard time knowing who was on Kiera’s side and who was just pretending – it was hard to trust any character, and it was perfect. As I mention in my review of the first book, this book is most definitely a “tween” read, so I wouldn’t recommend trying to read it from an As we get into book 2, the writing just keeps getting better. I most definitely read this one in one sitting. There wasn’t a boring moment, and the author did a great job keeping you guessing as to what was coming next. I even had a hard time knowing who was on Kiera’s side and who was just pretending – it was hard to trust any character, and it was perfect. As I mention in my review of the first book, this book is most definitely a “tween” read, so I wouldn’t recommend trying to read it from an adult point of view. This author really does a great job at putting herself in the shoes of a high school girl, with normal high school problems – and then some. For short stories Kristy Brown definitely knows how to lure you in. It's been awhile since I read the first book and I thought it might take awhile for everything to flow back but once I started reading, it all just rushed back to me and it was good to be back in the story. Kiera's adventure continues. After going through hell she's on a mission to help free her friend from the evil Witch Queen. 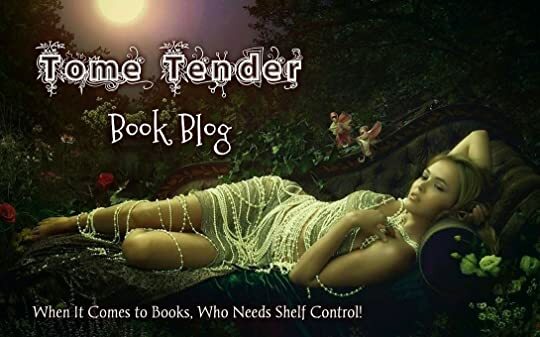 Zakk and Kiera sneak into the Evil witch's castle and helps free slaves, when things turn sour and sec For short stories Kristy Brown definitely knows how to lure you in. It's been awhile since I read the first book and I thought it might take awhile for everything to flow back but once I started reading, it all just rushed back to me and it was good to be back in the story. Kiera's adventure continues. After going through hell she's on a mission to help free her friend from the evil Witch Queen. Zakk and Kiera sneak into the Evil witch's castle and helps free slaves, when things turn sour and secrets are revealed. One in particular I didn't foresee, I was a little shocked lol. The Witch Queen is as evil as ever, she plans to rule the universe and she needs Kiera & Zakk to make that happen. The characters are just amazing and the storyline flows so well. You have everything here to keep you captivated, the only thing I had trouble with is that it ended way too soon. I was so upset when it ended, I need to know whats gonna happen next. Kiera had escaped the clutches of her enemy and thought she was safe again and home. Now she is told that she needs to go back and rescue her friend and in the process she will discover more about herself than she may even realize. . Returning once again to Zakk’s kingdom Kiera and Zakk must again face the enemy. This time the enemy has an even more diabolical plan and she needs Kiera and Zakk to complete it. I loved reading Kiera’s Quest Sacrifices and learning even more about Kiera and Zakk. Kiera stands strong in what she knows is right and through her belief in right despite what evil throws at her Kiera knows she has to win. You have to read Kiera’s Quest Sacrifices to see how she does it for yourself and while reading it you will join Kiera on an adventure you won’t want to end. Again a five star read from Kristy Brown. This review has been hidden because it contains spoilers. To view it, click here. "Kiera's Quest: Sacrifices" is the second installment in the Kiera's Quest YA series by Kristy Brown. The story picks up where "Awakenings" left off. Kiera has joined forces with Prince Zakk to save their friends Joe and Daz from the clutches of the evil Witch Queen. The pair must race against time and the Witch's minions to free their friends from the Witch's clutches and prevent her from taking over the Earth and the entire universe. "Sacrifices" was very fast paced and hard to put down. The gre "Kiera's Quest: Sacrifices" is the second installment in the Kiera's Quest YA series by Kristy Brown. The story picks up where "Awakenings" left off. Kiera has joined forces with Prince Zakk to save their friends Joe and Daz from the clutches of the evil Witch Queen. 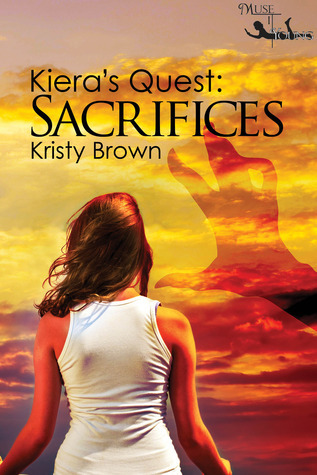 "Kiera's Quest: Sacrifices" is the second installment in the Kiera's Quest YA series by Kristy Brown. The story picks up where "Awakenings" left off. Kiera has joined forces with Prince Zakk to save their friends Joe and Daz from the clutches of the evil Witch Queen. This book 2 in the series can be read as a stand alone, or in sequence. Kiera is a gutsy young woman, who doesn't hesitate to jump in with both feet, especially when her good friend Zakk asks for help. Kiera finds out that all is not what it seems as she works to rescue 9 members from another world. this book has adventure, drama, typical teen antic's, that make it a great read for not just YA but any age group. Can't wait to see what happens next. It's a enjoyable short story that can easily be This book 2 in the series can be read as a stand alone, or in sequence. It's a enjoyable short story that can easily be read in an evening, in-between major novels, or if you want a read that won't keep you up all night. I was given and e-copy in exchange for my honest review. This is book 2 in the Kiera's Quest Series. In this installment, Kiera is on a quest with Price Zakk in his world to rescue her friend. Little did she know, she would actually have several lives to save. Will this quest be worth the sacrifices Kiera will have to make? And will she come closer to the truth of why or if she is the chosen one? This installment, in my opinion, is way better than the first. It is a little slower paced and gives I was given and e-copy in exchange for my honest review. This installment, in my opinion, is way better than the first. It is a little slower paced and gives more information. It didn't feel as rushed as the first installment. I think the author has grown a lot since her last book as far as her writing talents. Sacrifices picks off right where Awakenings left off. Kiera and Zakk go back into the fantasy world, and right away we are swept away into a magical world. Kiera definitely has to find her way in this one, and she also had to find her confidence. I enjoyed watching that development. A lot of different story lines are happening at the same time and each one is exciting. I couldn't wait to find out what was going to happen next. There was also different POV which I always enjoy. As with Awakening, I Sacrifices picks off right where Awakenings left off. Kiera and Zakk go back into the fantasy world, and right away we are swept away into a magical world. Kiera definitely has to find her way in this one, and she also had to find her confidence. I enjoyed watching that development. Well I just finished reading this second book in Kiera's Quest, and again I'd give it a high recommendation for an exciting, in your face adventure. Following the pacey trend of the first book, this launches you straight into the continuing adventure and you will quickly become absorbed by it just like in the first. There is a clear development .. no spoilers of course but things you thought you knew may twist or change into something else. I really enjoyed the quirky descriptions and extended c Well I just finished reading this second book in Kiera's Quest, and again I'd give it a high recommendation for an exciting, in your face adventure. Following the pacey trend of the first book, this launches you straight into the continuing adventure and you will quickly become absorbed by it just like in the first. There is a clear development .. no spoilers of course but things you thought you knew may twist or change into something else. I really enjoyed the quirky descriptions and extended cast, and found myself outright surprised through some of the plot twists. To the author: Keep it up and can't wait for what's next! I want to start off by saying that I received a free copy of this book in exchange for an honest review. Overall I enjoyed the second book of Keiras quest, however it was pretty slow paced even for such a short book (in my opinion anyway). Once the action got going it was very intriguing. I want to know what will happen in the next book especially since the vortex is closed. I would recommend this book to those who like fantasy books. Prince Zakk needs Kiera's help again, with the Witch Queen intent on ruling. Kiera is only coming to terms with her friends death, she and Zakk begin a journey that ends up affecting everyone they are close to. Another thrilling chapter to the Kiera's Quest series. There is a visual quality to the story, you can easily imagine the scenarios that Kiera and Zakk find themselves in. Great read. A brilliant follow up that begins exactly were book 1 Awakenings finishes and once again Kristy leaves the reader wanting more. Kiera is coming to terms with who she is, Maddy is missing her friend and there is an interesting twist with Captain Terrence. And there are still books 3 & 4 to look forwarded to. My YA contemporary romance book, "Just Sam," Is available on Amazon in print & on Kindle.